Collins Booksellers - Pocket Atlas of Acupuncture and Trigger Points by Hans-Ulrich Hecker, Angelika Steveling & Elmar T. Peuker, 9783132416024. Buy this book online. This concise pocket-sized acupuncture guide is what professionals have been asking for! It is the first pocket atlas to cover all the major body and ear acupuncture points, including extensive coverage of the trigger points. Detailed descriptions of the localization, needling depth, indications, and functions of each point are provided. The different schools of ear acupuncture (e.g., Chinese vs. Nogier), often a source of confusion for practitioners, are presented side by side, usually in full-page illustrations, enhancing this book's usefulness as a daily reference guide. The presentation of three acupuncture therapy systems follows a clear didactic concept: All points are shown in text and image, and the localization of the points is aided by means of anatomic drawings and photographs. Coming from diverse specialties, the authors provide you with the most complete, useful, and accurate information available. Acupuncture points are described using the "visual-didactic processing system," which is rapidly gaining praise and recognition for its easy-to-use format. The clearly written text is augmented by high-quality color images. 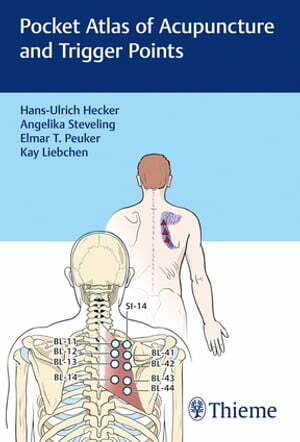 Hecker's Pocket Atlas of Acupuncture and Trigger Points is ideal as a quick reference in your daily practice or as an exam preparation guide. This wealth of information makes it invaluable to experienced practitioners and to novices alike.